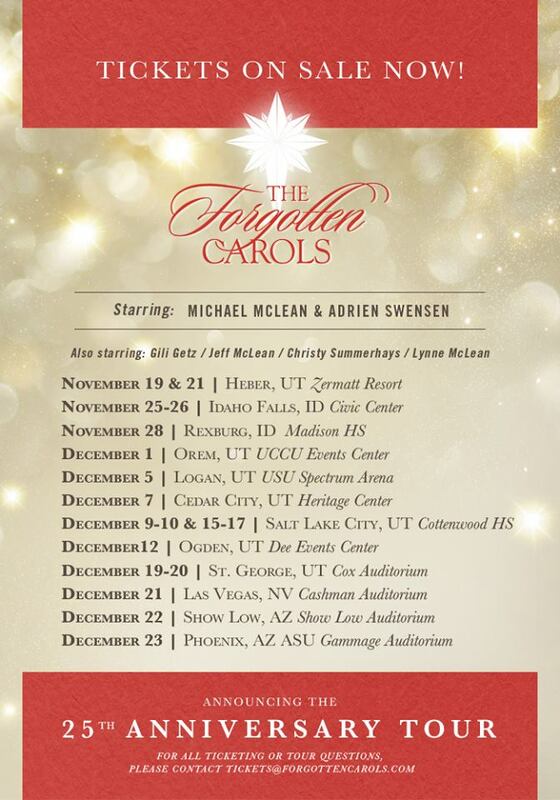 Michael McLean’s The Forgotten Carols concert will be in Cedar City, Utah on Wednesday, December 7, 2016 at the Heritage Center. The Forgotten Carols tells the story of a nurse whose empty life is changed when a new patient recounts the story of Christ’s birth as told by little known characters in the nativity story. The accounts from the Innkeeper, the Shepherd and others help her discover what the world has forgotten about Christmas, and open her heart to the joy of this special season. The 25th anniversary tour will feature Michael McLean and Adrien Swensen. It will also star Gili Getz, Jeff McLean, Christy Summerhays and Lynne McLean. There will be a matinee (4:00 pm, $18-$30) and an evening show (7:30 pm, $23-$36). Buy tickets for the matinee or the evening performance. The Forgotten Carols is recommended for ages 5 and older. Everyone 2 and older must have a ticket. No babes-in-arms. To be courteous to other audience members, if your child is causing any disturbance please exit the theater. 10% discount when a patron purchases 10 tickets for the same show in one online order. If purchasing through Eventbrite, please contact the event organizer at tickets@forgottencarols.com for a discount code. If purchasing through the venue’s ticketing site, please contact the venue’s box office.